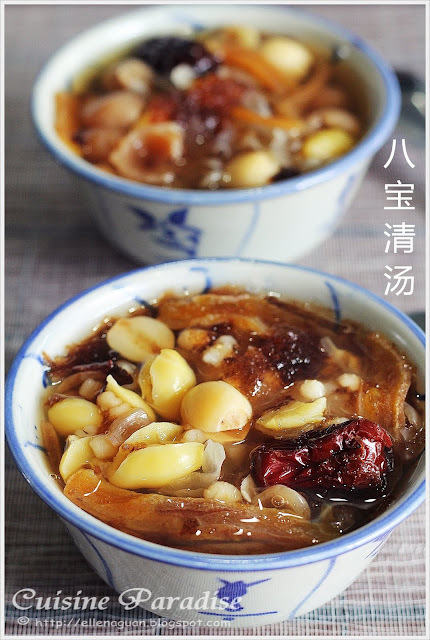 Cheng Teng(清汤) is a common sweet dessert that can be made at home or purchased at any local dessert stalls. And depending on individual’s preference you can either have this dessert hot or cold. 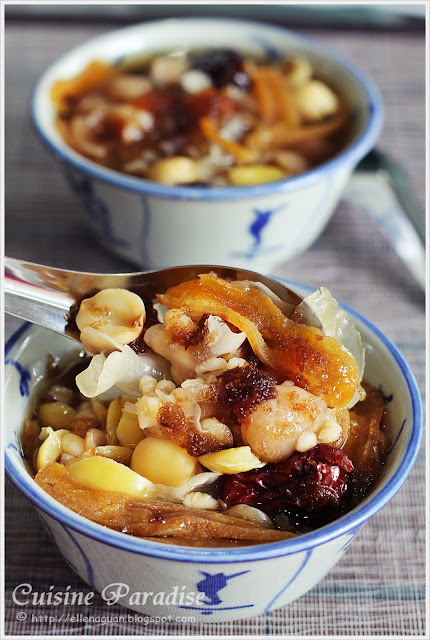 The ingredients of this dessert various from different stalls but the common ones are dried longan, barley, gingko nuts, lotus seeds and Pang Da Hai(胖大海) which is believed to be able to get rid of humidity and “heat” of the body. Actually there is no specify ingredients to cook Cheng Teng, you can add or minus ingredients that you like/dislike depending on your preference. Here I have missed out some Agar Agar strips and Pearl Sago which I do not have in my pantry. 1. 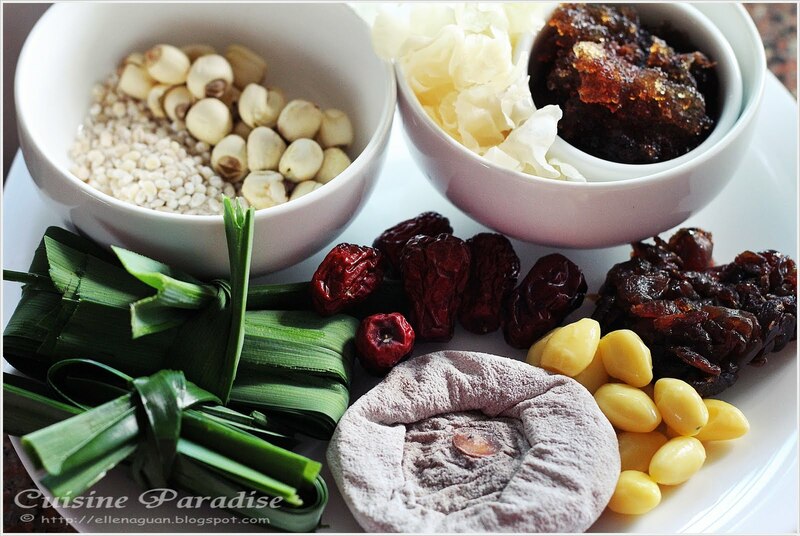 Soak white fungus and dried lotus seeds separately in warm water for about 10 minutes till soften, trim into small clusters and discard the stem portion. Set aside. 2. Remove the green pith from the center of the lotus seeds to prevent bitter taste when cook. 3. Rinse the pearl barley for 2 to 3 rounds, set aside and bring 1.8 litres of water to boil in a medium pot. 4. When the water comes to boil, add in pearl barley and white fungus and continue to simmer over medium low heat for about 15 minutes. 5. While waiting for the barley mixture, soak pang da hai in warm water until the seeds split open, remove the outer shells and discard the water. Set aside. 6. Next add in lotus seeds, dried longan, red dates and gingko nuts together with pandan leaves and cooked for another 20 minutes or till ingredients soften. 7. Lastly add in cane sugar to taste, turn off the heat discard pandan leaves and add in prepared pang da hai and dried persimmon. 8. Serve either warm or cold. Have you tried cooking Cheng Teng at home before? If you do perhaps you can share with us what's your method and the must have ingredients to make this sweet dessert.